It’s been roughly 7 months since AMD released the Crimson ReLive Edition update for Radeon Software, the latest entry in their annual cadence for major driver revisions and feature additions. Today’s launch sees AMD/RTG bring the sequentially and demurely named “Radeon Software Crimson ReLive Edition 17.7.2,” but for all intents and purposes 17.7.2 serves as a major feature revamp to the original Crimson ReLive Edition, as well as refinement of Radeon ReLive and Radeon Chill. In addition to performance optimizations and feature changes, 17.7.2 also introduces AMD’s new Enhanced Sync (comparable to NVIDIA’s Fast Sync and Adaptive V-Sync) and Radeon GPU Profiler, a low-level GCN hardware tracing developer tool. Taking a step back, 17.7.2 adds to the regular pace of AMD’s graphics overhauls in recent years: Catalyst Omega (12/2014), Radeon Software Crimson Edition (11/2015), and Radeon Software Crimson ReLive Edition (12/2016). While not a wholly new Radeon Software edition, 17.7.2 does show a commitment to improving graphics software features outside of those yearly ‘all-in-one wonder drivers,’ building on AMD’s ongoing efforts to improve user experience. 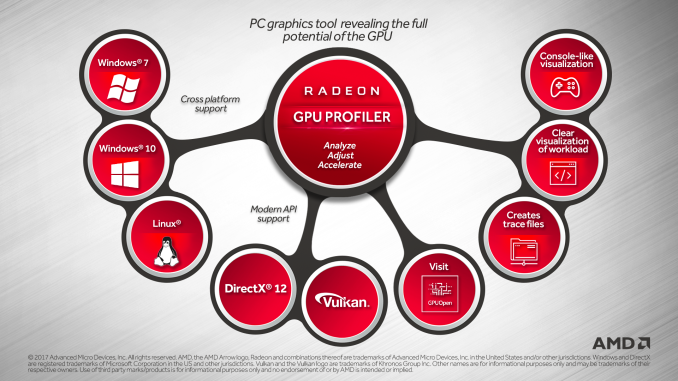 On that topic, AMD today is also launching the Radeon Software Vanguard Beta Tester program. 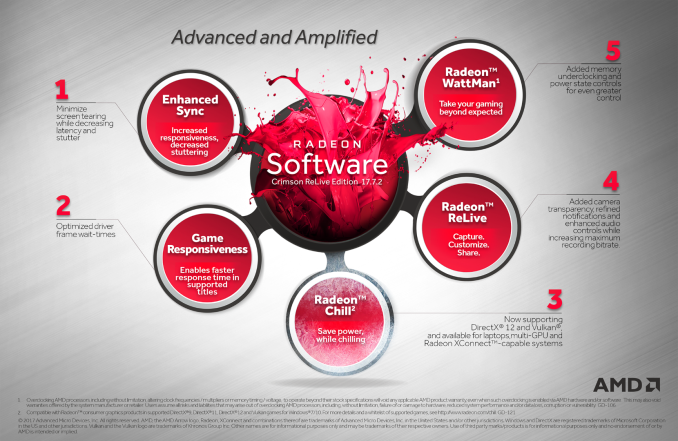 Overview of Radeon Software 17.7.2: What’s in the Driver? 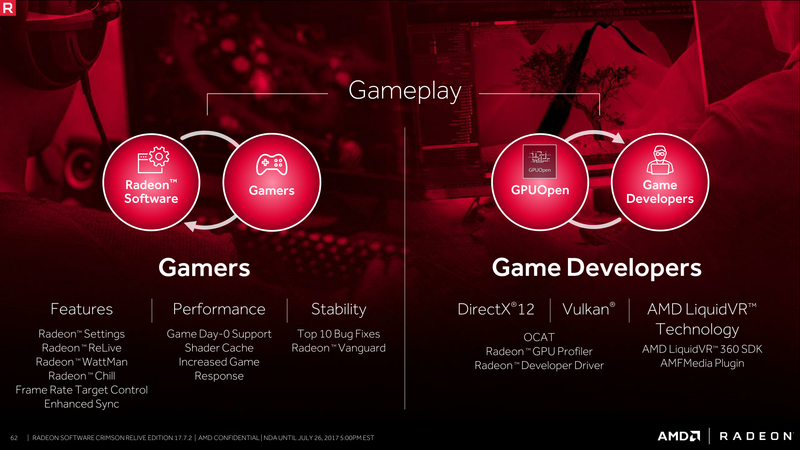 Similar to the original Crimson ReLive Edition, AMD has broadly outlined 17.7.2 into two areas: gamers and game developers. Many of the changes and improvements revolve around previously introduced software features; for readers unfamiliar with the mentioned features, more detailed looks can be found in Ryan and Daniel’s Crimson Edition launch piece, as well as Ian’s Crimson ReLive Edition launch piece. For gamers, 17.7.2 includes quality-of-life changes for Radeon Software, fulfilling the top two most-voted feature requests: folding in Radeon Additional Settings into Radeon Settings, and bringing back advanced video feature options with new per-display color controls. AMD has also brought some quality-of-life and recording improvements to Radeon ReLive, as well as broader support for Radeon Chill in terms of more games/APIs and more GPU configurations (including Radeon XConnect). In the same vein, WattMan has been updated with memory underclocking and “per power state” control, while FRTC has been updated with DX12 and mGPU support. Rounding out these feature enhancements is Radeon Software support for AMD’s new Enhanced Sync, a V-Sync replacement that can mitigate latency and stuttering. Lastly, 17.7.2 brings general driver optimizations, as well as driver frame wait-time and shader caching improvements. Moving on, the developer oriented changes fall under the GPUOpen umbrella. First off is an update to Open Capture and Analytics Tool (OCAT) – AMD's open source successor to FRAPS – which was introduced in Crimson ReLive. AMD stated that this is largely a stability update, particularly targeting certain misbehaving games, and additionally brings Windows 10 Creators Update support. Concluding the new developer features is the AMD LiquidVR 360 SDK. This enables end-to-end GPU-accelerated HEVC 4K x 4K VR video playback, as well as 6-channel spatial audio in the form of Immersive Ambisonic Audio. You might be surprised. There are a bunch of us who are moving to 8.1 in order to avoid 10. On some of the sites I frequent, Windows 8.1 is probably about as popular as 7. Once people realize that you can de-stupidize 8.1 and have something that can ward off 10 for more than half a decade, it begins to look pretty good. It took something as bad as 10 to make 8 look like a reasonable product. I avoided 8 like the plague when it came out; I only migrated from XP to 7 well after 8.x had already become the new "Vista." But after a year of Windows 10, I looked back at 8.1 and wondered why I'd hated it so; it seemed so benign compared to 10. Yes, it needed a lot of help to get the UI into shape, but I realized that I used those very same tools on 7, so what difference would it really make if I did that on 8 also? "For gamers, 17.7.2 includes quality-of-life changes for Radeon Software, fulfilling the top two most-voted feature requests: folding in Radeon Additional Settings into Radeon Settings, and bringing back advanced video feature options with new per-display color controls"
I haven't updated to this version yet, but HDMI overscan settings were buried within "additional settings" in the first iterations of ReLive and would still pop up in the old CCC window.